It is a prolific bloomer, putting out its nocturnal white flowers from spring to autumn. The flowers arise from near the top on the sides of the stems. Origin and Habitat: Brazil, northern Argentina and Paraguay. Description: Monvillea cavendishii is a night-blooming cactus with long, slender, half-erect stems, more or less branched at base often forming thickets. The stems are slender, pale green in colour, and bear fine, short spines. It is generally included within (as a synonym of) Praecereus saxicola |SN|7705]], suggesting that there is not really a fundamental difference between the two, and hard to name accurately without knowing where they come from. 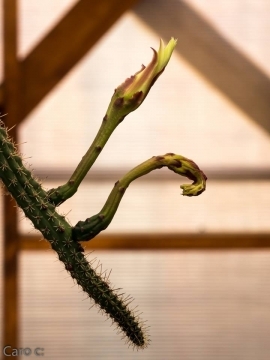 This is one of the best flowering cactus species in cultivation. The white flowers open at night and appear more or less abundantly from spring to autumn and are borne toward the top of the stem. The flower-tube is slender, straight without felt or spines and the stamens and style are more or less exserted. The fruit is glabrous, red, plump, spineless. The flesh of the fruit is white, juicy with many small, black seeds. Derivation of specific name: he generic name of this member of the cactaceae family commemorates William Spencer Cavendish, Duke of Devonshire, who had a magnificent collection of plants at Chatsworth. Stems: Suberect, arching or clambering, branching at base, pale green to dark green, 2-3 cm in diameter. The fast-growing stems can reach a height of 1-4,5 metres as they ramble on the ground or work their way through tree branches. Ribs: 7-9(-10), low and rounded. Areoles: Small, about 5-15 mm apart. Radial spines: 6-10 short, acicular to bristle-like, yellowish brown. Flowers: The flowers with slender tube arid broad limb arise from near the top on the sides of the stems. They are 10 to 13 cm long, 6-10 cm in diameter, the tube 5 to 6 cm long. Outer perianth-segments pinkish or greenish. Inner perianth-segments white; ovary small, bearing a few very small scales, these broader than long, with minute brown chartaceous tips, their axils naked. Fruits: Globular to ellipsoidal, 5-7 cm long, 4-5 cm in diameter, red. Flower-tube rigid after anthesis, withering on the fruit. Monvillea cavendishii (Monv. ex Salm-Dyck) Britton & Rose: It is generally included within (as a synonym of) Praecereus saxicola , suggesting that there is not really a fundamental difference between the two. Praecereus saxicola (Morong) N.P.Taylor: stems more than 2 metres long 1.5-3 cm Ø with fine, short spines. Flower 10-13 cm long, 6-10 cm Ø, tube slender without felt or spines. Distribution: Argentina, Brazil, Bolivia, and Paraguay. 4) Haustein “Der Kosmos-Kakteentiihrer”. 121.1983. 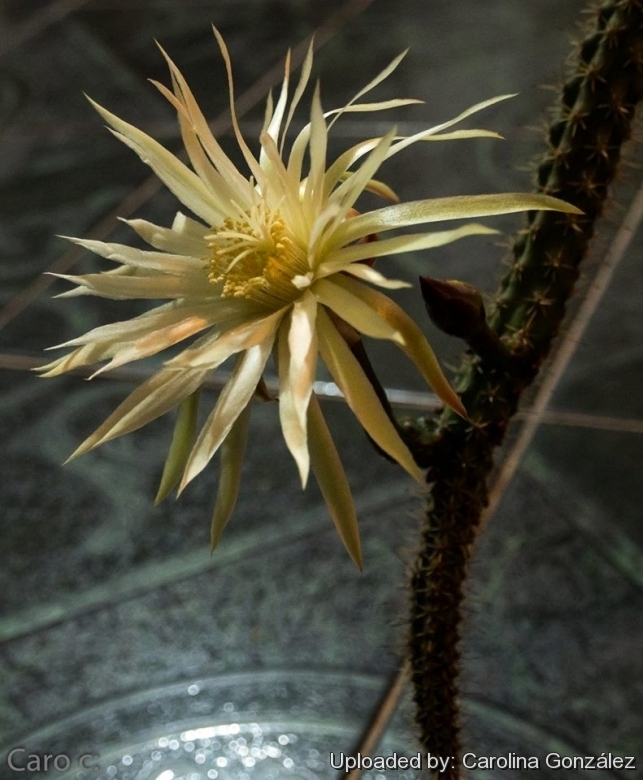 Cultivation and Propagation: Praecereus saxicola is grown as an ornamental because of its beautiful nocturnal flowers. It is a fast growing plant that form thickets, the spiny stems often high-clambering or drooping, depending on where they grow. If you can keep it warm over the winter, then Praecereus saxicola with its lovely flowers appearing during the night, is not as difficult as it is made out to be. It rarely planted outdoors in tropical countries, where climbs trees in a semi-naturalized state. In nature it climbs into trees. Older plants in the greenhouse buds freely. 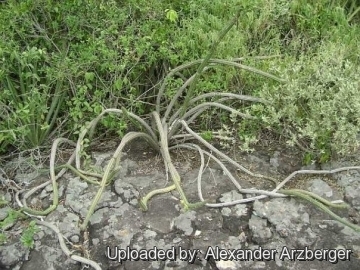 Uses: Praecereus saxicola, is often used as stock for grafting.